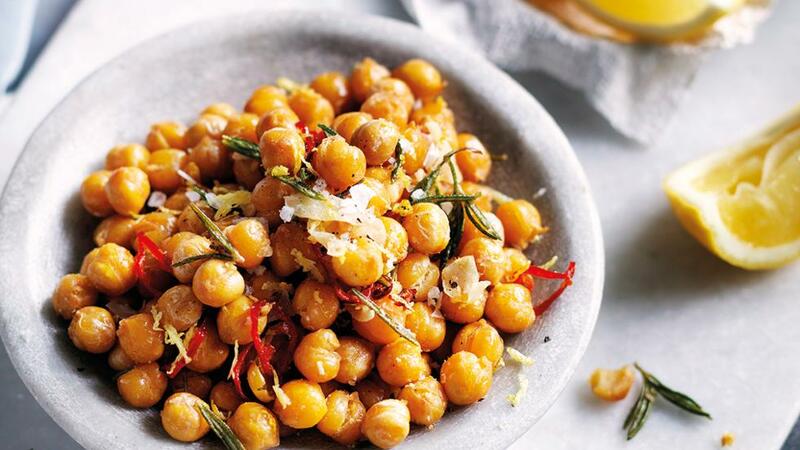 Generously cover chickpeas with water in a saucepan, bring to the boil over medium-high heat and cook until just tender, 50-55 mins, then drain and spread on a tray lined with baking paper to dry (30 mins; this helps stop the chickpeas spitting when you fry them). Heat 1cm oil in a large, deep frying pan over medium-high heat until just shimmering. Add chickpeas and stir continuously until beginning to crisp and become golden, 4-5 mins, then add rosemary, chilli and garlic, and stir until fragrant, about 1 minute. Add lemon rind, stir to combine, then strain through a metal sieve into a heatproof bowl (discard oil). Generously season to taste and serve hot scattered with grated parmesan and with lemon wedges to squeeze over.